In the last year or so, a Mysterious List of Words & Logos have appeared on the web: Digg, Del.icio.us, PopURLs, Reddit, Fark, Blue Dot, StumbleUpon, tags, Ikeepbookmarks, and so-on. This latest set of techniques is known as social bookmarking. Social bookmarking can affect search engine position and provides an alternative approach for viewers to navigate the web. Are all these services worth participating in and are they all the same? NO, some are specialized in some area, some are small, and some are old fashioned (can you believe it? There are already some old fashioned sites in this latest and greatest trends. ex Ikeepbookmarks). StumbleUpon.com provides a new way to go around the net following links established by people who have recommended sites by category and popularity. Digg.com is all about articles. People vote. technorati - A multimedia listing by tag of blogs, music, pictures. Furl - A listing by tag of websites. Reddit - Articles get tagged and voted upon with the votes weighted by the taggers karma. This is the least corporate (albeit owned by conde nast) of the services. FIQL & Netlister - sharing playlists. 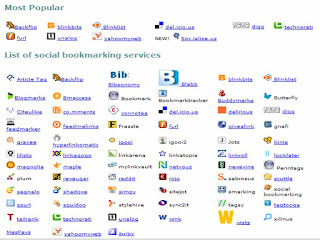 Social bookmarking is that almost everyone else finds it useful. When a bunch of people whose opinions you respect tell you that something is good, it suggests that you’re missing something and need to think again.